It's 10 AM. Do you know where your Children are? 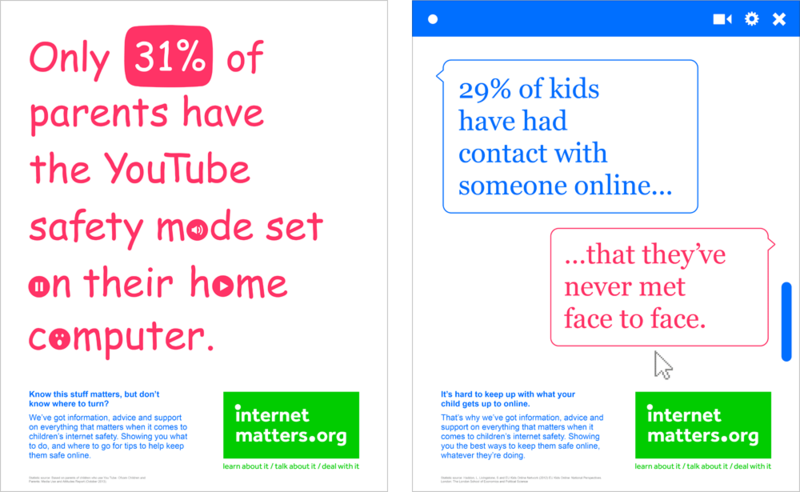 Launched today, Internet Matters is a joint initiative from the four major internet service providers in the UK — Sky, Talk Talk, BT, and Virgin Media — that establishes “an independent, not-for-profit organisation to help parents keep their children safe online.” By compiling facts, organizing them by child age, offering information, and providing practical suggestions, Internet Matters aims to make internet usage for children safer and more secure (and for parents to not freak out when a Dora the Explorer video on YouTube has been dubbed with profanity). The organization’s new name and identity were created by London-based venturethree. We created the brand strategy for the new initiative and the brand name Internet Matters — with a double meaning — to reflect the fact that this is a serious-modern day issue that parents haven’t had to deal with before. Typing in the logo. Sound needed. Even more typing in the logo. [When] we were doing our research for the campaign, the facts were so arresting that we made them a core part of the brand identity. Presenting them with complete neutrality nailed the awareness right away. And we kept the look super-simple and based around the vernacular of the internet, from sounds to symbols to the most popular fonts used online. The limited applications, for now, are in the form of static and animated ads that take their cues from the basic common denominators of the internet’s visual language: the ubiquitous fonts (Verdana, Courier, Comic Sans, and Georgia), boinky sound effects, RGB color palette, and white Microsoft cursor. The results are not necessarily appealing as we understand appealing-ness but they communicate efficiently and directly — and the ugly-on-purpose-design-lover in me really likes this. Overall, it’s a simple and striking campaign that should get parents to pay attention. Launched today, Internet Matters is a joint initiative from the four major internet service providers in the UK — Sky, Talk Talk, BT, and Virgin Media — that establishes \"an independent, not-for-profit organisation to help parents keep their children safe online.\" By compiling facts, organizing them by child age, offering information, and providing practical suggestions, Internet Matters aims to make internet usage for children safer and more secure (and for parents to not freak out when a Dora the Explorer video on YouTube has been dubbed with profanity). The organization's new name and identity were created by London-based venturethree.